The sockeye were here in record numbers this year and not only that, were tastier than previous years too… nice and fatty. I even got out for some fishing action myself a couple of weeks ago with fishchilliwack.com and now my freezer is full of salmon. I’ve BBQ’d a couple of fillets, but I’ve been hankering for sushi and that fresh pink meat was looking pretty tasty. The Japanese agree with me, apparently, as sockeye is one of their favorite salmon to eat as sashimi. 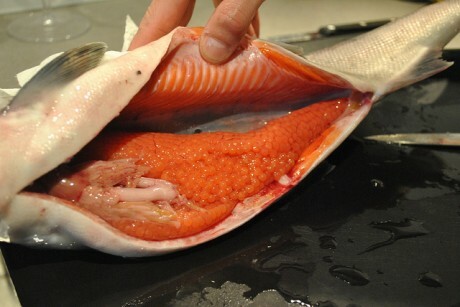 As a plus, one of the salmon was full of roe. Ikura, anyone? I froze both the salmon and the roe, to kill off any parasites that may have been included, then to make ikura, you’ll need some sushi rice, seaweed (nori), wasabi paste, salmon roe and quail’s egg (optional). 2. Spread the rice onto a large plate and sprinkle rice wine vinegar mixture over it. 3. Form little oval balls of rice, wetting your hands with some of the rice wine vinegar mixture as you go to make it less sticky. 4. Cut the nori into strips about 1 inch thick and wrap each strip around each rice ‘boat’, holding the nori in place with a few grains of sticky rice. 5. 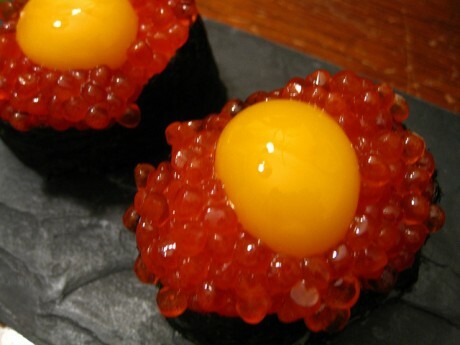 Place a small dab of wasabi on each rice boat and top with salmon roe, then a raw quail’s egg yolk, taking care that it doesn’t slop over the edge. I did not fillet my salmon as nicely as Anthony demonstrated, so I made hand rolls out of the salmon meat instead of nigiri style sushi that calls for a very thinly sliced fillet. 1. Filet the salmon (if not already done). Keep the skin for BBQ’d salmon skin or tempura if you like, but I threw mine out this time around. 2. Slice the fillet as thinly as possible with the sharpest knife you have. If you are sawing back and forth with the meat, you’re just going to make a mess. 3. Remove any bones with tweezers. 4. Cut the nori into squares, about 5″ x 5″ and put a dab of rice in the upper corner of the square. 5. Place a dab of wasabi paste on the rice and then top with a few pieces of salmon. 6. Roll it up into a cone and pin with a couple of grains of sticky rice. 7. Serve both with more wasabi, pickled ginger and Japanese Soy Sauce. The ikura was delicious but the salmon sushi wasn’t the best I’ve ever had. I’m not sure if this was because they came from the same salmon (i.e. : a spawning female) but I’m going to try it again with the male I have thawing. this is just crazy cool. how can I get me some of this action/ All we need is some uni, some seaweed and some nice sushi rice and we can make the narcotic nigiri known as “HORSEPOWER”. Just wondering, how did you clean the roe? I had some too in the salmon I bought and wanted to make ikura but couldn’t figure out how to prepare it and threw it away! would like to know for next time. Thanks! I just rinsed it really well in cold water. There is a bit of a skin that you have to separate but it comes off with some attention.